As mentioned before, we don’t mind sharing our apples, and in the fall, we tend to be too lazy to harvest the ones on top of the tree make sure to leave some for our winter guests. They remain largely disregarded for most of the fall and throughout early winter, but once they have gotten the right amount of frost (I imagine the principle is the same as that for ice wine), they tend to be very popular. This particular gourmet is a new one to our garden. 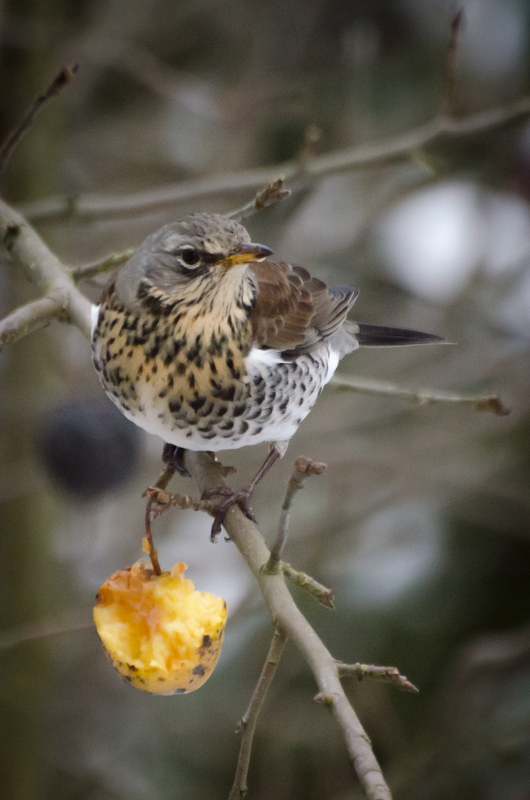 The all-knowing internet tells us it’s a fieldfare or Wacholderdrossel (“juniper thrush”) in German. According to the German wikipedia, it winters further south and starts heading home in mid-February, so our visitor is clearly the early bird that got the apple and quite possibly the first sign of spring. This entry was posted in Birds, Critters, Secret garden and tagged apples, Birds, fieldfare, seasons, Wacholderdrossel, winter guests. Bookmark the permalink.